Bart DeMalignon sent me another e-mail. This one featured the Chamber Office and Information Center in Chama, New Mexico. 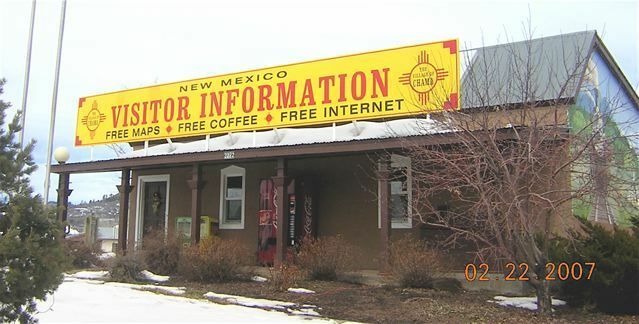 He pointed out that this Visitor Center offers free coffee, much like Wall Drug’s free water. It reminded me of a bait shop in Two Harbors, Minnesota. I’ll take credit for this one. I put it on the list. I think Victor or Bart might have mentioned it though. What about roller rink? How is that coming along. Isn’t Griff a roller coach when the blogging biz is slow? …Yo Braucher, we’re gonna need a really creative engineer for that floor. These are the kind of blue collar jobs Northfield needs. Kudos. There is live bait and other fish-related stuff at the back of Corner Mart gas station by Fire House Liquors down Hwy 3. Do folks think we need another outlet? If this bait shop suggestion was just another faux news item, I’ve taken the bait. let’s call it Half Faux, perhaps as in Half Full of Beans. …and I had this vision of this one Bait Shop that I visited with an Uncle back in about ’67. It must of been Opening Day, ’cause there were maybe two customers and six “conversationalists” hanging around the wood stove. I envisioned free coffee…and, from the conversationalists warming their bellies, free tourist suggestions like “if it’s raining too hard to fish, check out the Historical Society’s new exhibit on Anne North’s piano, or one of our many art galleries, or stop in and use the Public Restroom at our Carnegie Library, and if you’re around tonight (get a room at the Archer House), there’s a number of places featuring fine food and live music”. Just an idea, you understand, maybe half full of beans and half full of potential.